Skin and ear infections with yeast are frequently diagnosed in dogs evaluated by veterinarians for skin problems. Yeast skin and ear infections are also seen regularly in cats, however not quite as often as in dogs. Most cases of yeast skin or ear infection are triggered by an underlying disease affecting the skin, such as allergies or endocrine disease (hypothyroidism, Cushing’s disease, etc.). The type of yeast we see on the skin and in the ears of cats and dogs is almost always Malassezia yeast. This is a different than the yeast which causes most yeast infections in humans- Candida. Malassezia yeast are a normal inhabitant of the canine and feline skin. In an animal with normal skin, these yeast organisms live on the skin surface and in the ear canals in very low numbers and do not cause a problem. When an animal has a disease affecting the skin, there are changes in the skin barrier function, skin immune system, and the skin microenvironment. These changes can allow the yeast population to get out of control, leading to a yeast overgrowth or yeast infection. Because there is usually an underlying disease process leading to the yeast infection, these are referred to as secondary infections. The symptoms of yeast skin infection in dogs and cats can include scratching, licking, biting, chewing, rubbing, dandruff, skin changes (redness, dark pigmentation, greasiness, or thickened skin), red-brown discoloration of the fur and claws, and malodor. Symptoms of yeast ear infection can include redness, thick dark brown ear discharge, malodor, head shaking, and ear scratching. 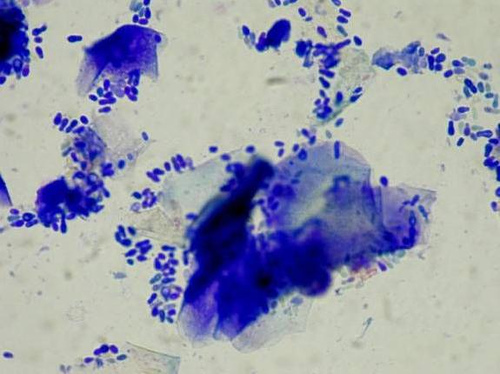 Yeast infections can be suspected based on observation of these symptoms, but since other skin/ear problems can cause similar symptoms, the diagnosis is confirmed by performing skin surface or ear cytology. This is an in-clinic test in which the doctor will collect a sample from your pet’s skin surface or ear canal and examine the sample under the microscope. This quick and easy test will allow the doctor to confirm the diagnosis of yeast skin or ear infection by observing the characteristic Malassezia yeast organisms under the microscope. Treatment of yeast skin or ear infections in dogs and cats involves the use of antifungal medications administered orally and/or topically. It is also important to investigate any potential underlying diseases which may be triggering the yeast issues, as mentioned above. For example, if the patient has an untreated allergic condition, the yeast issues will continue to be a recurrent problem until the allergic disease is addressed. There are a lot of common misconceptions about yeast infections in pets. The one that we probably hear most often is that yeast skin and ear infections occur because of a dietary imbalance. Special “yeast diets” for pets which attempt to minimize dietary sugars are promoted all over the internet. This idea draws from the fact that there is some evidence to show increased intake of dietary sugars can predispose people to Candida yeast infection/overgrowth of the genital or gastrointestinal tract. Unfortunately, these “yeast diets” are ineffective in dogs and cats with Malassezia skin and ear infections. Not only are we dealing with a different type of yeast in our veterinary patients, we are also dealing with different body locations (skin and ears versus gastrointestinal or genital tract). Malassezia yeast infections in pets are not affected by dietary sugar content. Secondary yeast skin and ear infections are a common problem in dogs and cats, however with proper diagnosis and treatment these infections can be controlled and symptoms minimized or eliminated.